One of the best ways to avoid getting bored and/or lonely after you move to a new place is to make an effort to get up and go explore what’s out there instead of sitting at home alone. 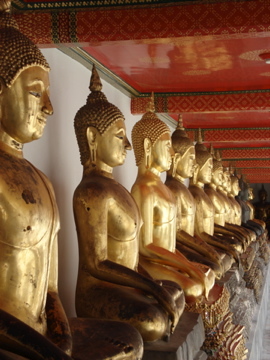 So today I set out to get some of Bangkok’s more famous tourist traps out of the way and cross them off my list. 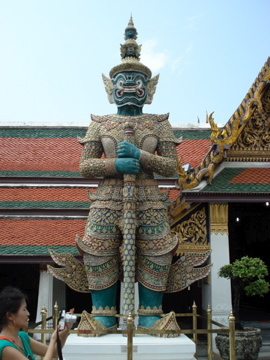 To tell you the truth, I’m not all too fond of Thai temples. They are so freakin’ bright and garish and covered with glass and gold and glitter and sparkles that it is almost blinding to look at them. Very different to the minimalist Japanese style, and the darker red style of Chinese temples. 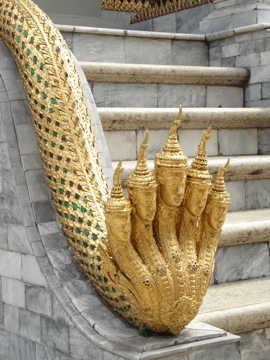 My contacts were killing me by the time I left the Grand Palace. On top of that, it also reminded me of my trip to Beijing where I visited the Forbidden City. 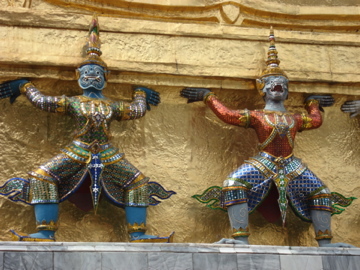 Both the Grand Palace and the Forbidden City have certain things in common — they are huge complexes that are now largely empty and full of no one but tourists and touts. 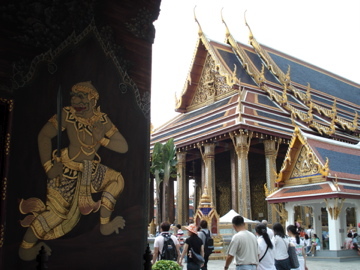 It is hard to get a true feeling of the cultural/spiritual importance that these buildings once held when they don’t have anything inside and the only Thai people there are security guards and tour guides. 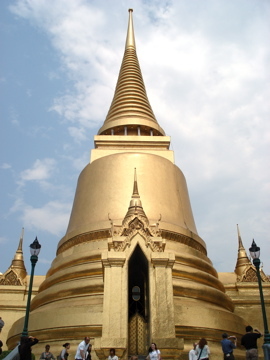 I know that the Grand Palace was once a working, living, beating spiritual heart of the city, but now, in my opinion, it is little more than a very beautiful, glittery, hollow shell. 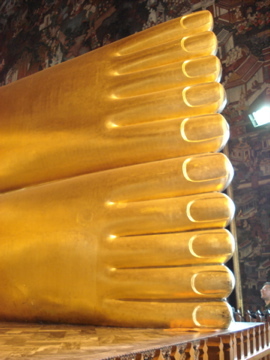 Anyways, once I got burnt out of the Grand Palace, I took to the streets and set out to find Wat Pho, another major attraction nearby, famous for being the home of the Giant Reclining Buddha. This I thought was pretty cool. 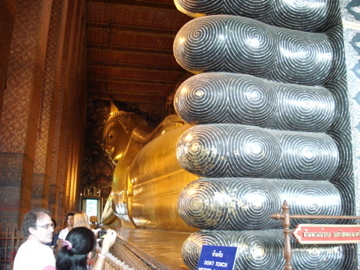 The Reclining Buddha is very very huge — 46 metres long and 15 metres high. 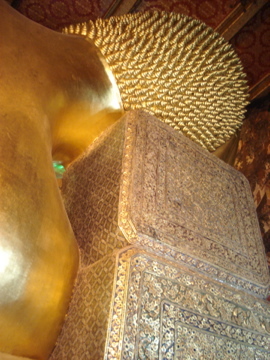 He lays peacefully in the center of the temple, and visitors circumnavigate the statue in a clockwise rotation. 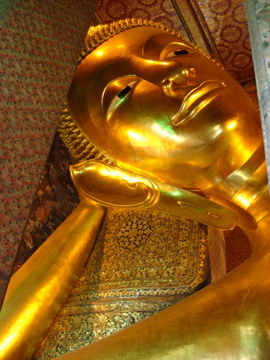 By then I was absolutely exhausted, and overwhelmed by all the sights I had seen in just five hours… the tuk-tuk drivers shouting ‘Hello madam’ to give you a ride, the smell of fried chicken, pepper and garbage wafting in the air, tables and tables of clay Buddha amulets for sale, blind people begging for money, Thai tour guides speaking fluent Russian, European tourists not wanting to take off their shoes before entering a temple, stalls of fake DVDs and second hand books, super sweet iced coffee sold not in a cup but in a plastic bag…. 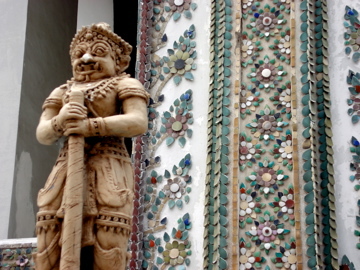 Bangkok is certainly an assault on all five senses! I jumped in a taxi, got a drop to the train station, and headed home. Today was a good day. Intense, but good. And, there is much more to see. Great Pictures! 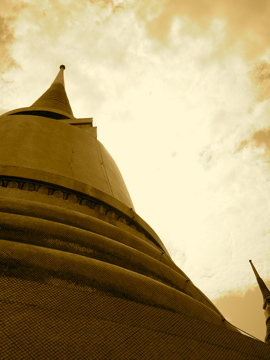 Do the Thai people then worship in their homes, or are there smaller temples? 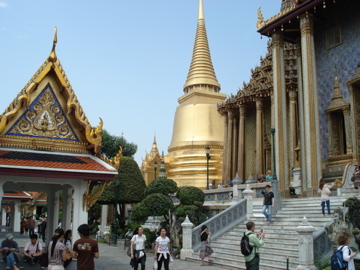 There are temples everywhere!! Each neighborhood seems to have a small temple — they are all over the city. 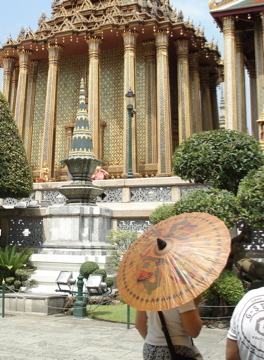 The Grand Palace though is now more of a tourist trap than anything. 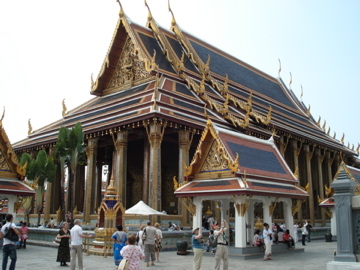 There were not many Thai people worshipping there.